Through similar experiments where electric shocks controlled his body, Alexander von Humboldt proved that our relation to our body was merely a matter of electric currents! I know! But many others are even more troubling, as they yield mind-blowingly surprising and humbling results. Let’s review them! That’s not that troubling, is it? What’s troubling is that, meanwhile, people still tend to claim they prefer Coke to Pepsi, even in tests, as long as they know which is which. Let me guess… That didn’t work! Worse than that! There were huge demonstrations, protests and requests for a return of the old Coke. At some point, the Coke’s headquarter was receiving 8,000 complaints every day! Amazingly, the symbols of the brands were far more determinant in people’s preferences than the actual tastes of the beverage. It’s called the halo effect. Eventually, Coke made public apologies… And its sales boomed! To the point where speculations of conspiracy claim that Coca Cola had all orchestrated all along! To which CEO Donald Keough famously replied: “We’re not that dumb, and we’re not that stupid“. So, I guess that people prefer Coca Cola because they intend it to be a symbol of the American way of life! It might not be intensional! In 2012, an experiment by Kühn and Gallinat has studied the brain activity of drink tasters. In this experiment, subjects were asked to value 4 drinks (Coke, Pepsi, River Cola and T-Cola), the last one being made up. While they tasted the drinks, an IRM was monitoring brain activity. Now the trick is that the 4 drinks were actually all the same: A mixed of Coke, Pepsi and River Cola. Not surprisingly, Coke and Pepsi were clearly preferred to the two others. But more interestingly, the parts of the brains at work in the 4 cases were totally different! When tasting River Cola and T-Cola, the orbitofrontal cortex was much more working to come up with a judgement. Meanwhile, while having Coke and Pepsi, the ventral striatum was more active, delivering rewards and pleasure. Crucially, depending on what subjects were told, different unconscious reflexes were triggered in the brain, which, without the beauty of science, we’d never even be aware of! This shows how much we are fundamentally wrong about the causes of our judgements. And the next experience enhances this even more! In 1950, pioneer social psychologist Solomon Asch astonished the world with a very simple experiment. 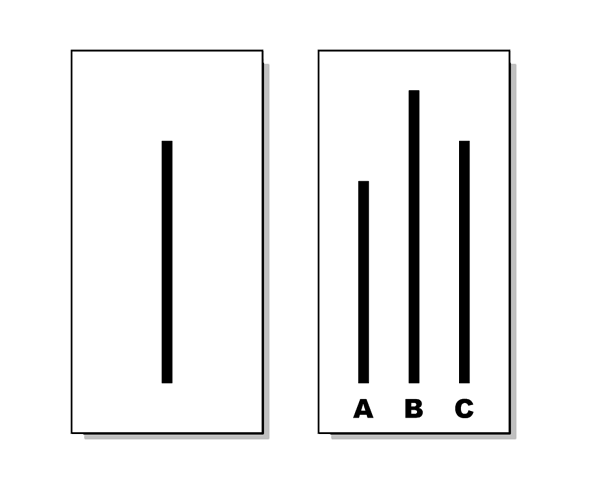 In this experiment, subjects undergo a visual perception test. Take the example on the right. Each subject was asked to match the line on the left with the line on the right that has the same length. The answer is clearly C! Yes! And over 99% of the times, subjects got it right! So far so good. But, Asch then decided to place each subject in the same room as 5 actors. Subjects are told that actors are in fact other subjects. The actors and the subject were then asked to take the same visual perception tests out loud. Most of the actors were answering before the subject, and they sometimes gave a wrong answer on purpose. In this different setting, 75% of subjects ended up making mistakes! And, when actors were giving wrong answers on purpose, subjects agreed with actors 30% of the time! So, amazingly, judgements were highly influenced by the surrounding, even though the exercises were very easy and straightforward.! Has this experiment been repeated? Yes! Over and over, actually! Now what’s interesting is that in debriefings after Asch’s experiment, many subjects have then reported to have agreed with actors so as not to upset them. Others have ended up accepting others’ opinions as more relevant that theirs. However, and that’s the most troubling, some subjects actually didn’t even realize they had ever been wrong! What puzzles me in this experience is that the group influence occurred in a very short amount of time and on a very straightforward judgement test. In practice, we have all grown up in environments whose influence has been accumulating for decades about much less straightforward judgements such as religions, ideologies and other beliefs… After all, most educated people claim Darwin’s theory to be true without being able to clearly explain why it seems to hold! Isn’t Asch’s experiment about the conformity of actions rather than beliefs? Yes it is. But many experiments hint at a habit in actions being a source of beliefs. In fact, social anthropologist Jairon Cuesta, in the following video extract by Crossroads.com, argues that conformity in Asch’s experiment started with actions, but then moved to judgements… and then ended up with perception! But before going as far as to discuss our judgements and perceptions, let’s focus a bit more on how much a social environment can affect our actions! The next experiments of our list here is one of the most controversial of the 20th century. It was designed by American psychologist Stanley Milgram in the 1960s. Milgram aimed at explaining the violence of Nazi Germany by the influence of authority on Nazi soldiers. Milgram’s experiment consists in having a subject coming for a memorization technic experiment. An actor (the learner) had to be taught memorization through exercises, while the subject (the teacher) was teaching him by punishing every mistake. The punishment was an electric shock, whose voltage was increased after each learner’s mistake. In reality, the actor was not given electric shocks, but he did scream of pains and asks the teacher to release him. The voltage of electric shocks went as high as 450 Volts, with signs of fatal dangers. And the secret goal of the experiment was in fact to find out whether the teacher would go to voltages as high as fatal ones. I’ll let you discover that in this video:. So, as it turned out, 2/3 of subjects administered electric shocks potentially fatal to their fellow subject! Needless to say that this shocked America. Really? I can’t imagine myself doing that! That is shocking! But has this experiment been redone? That is profoundly shocking and disturbing… How on earth could subjects do that? One explanation lies in the diffusion of responsibility. By not being taking the main responsibility of their acts, people can be led to do highly unethical actions… and hence letting authority rule. A variation of this phenomenon is the bystander effect. This is what’s explained in the following extract, where an injured person would be less likely to be given help in a more crowded environment! That’s appalling! But that’s not quite as horrible as administrating fatal electric shocks! I know. And there seems to be an even more important factor in Milgram’s experiment, which is the environment. In particular, the fact that subjects sit alone with an authority which strongly looks reliable seem to be crucial in their following unethical orders. An even more illustrative evidence for that was given by the next experiment we’ll discuss. Building upon Milgram’s experiments, American psychologist Philip Zimbardo put forward the extremeness of the environment to explain Nazi soldiers’ unethical actions. He illustrated this through the infamous Stanford prison experiment. What’s the Stanford prison experiment? On the 6th day, graduate student Christina Maslach visited Zimbardo. She got horrified by the violence with which guards were treating prisoners. Disturbingly, it was only when told so that Zimbardo, who was also playing the role of the prison intendant, realized the violence of the situation and the long-term effects they could have on the 24 remaining students. He immediately aborted the experiment. What troubles me the most is how even Zimbardo himself got so involved that he didn’t realize the awfulness of what was happening in front of his eyes! He argued that he wasn’t the only one: Prisoners didn’t ask to leave the experiment even when they were told they would not be paid anything, and guards were sad about the experiment being terminated. So I guess Zimbardo proved his point: Environments do have a strong impact on people’s behaviors! It surely seems so… At least, this is how he explains US soldiers’ unethical deviances in Iraqi prisons. WARNING!!! The following video contains images of intense violence at 5:04. You might want to skip it and jump to 7:18 for Zimbardo’s key question. You might want to watch the talk entirely, as it’s pretty great. In the sequel, he explains the Milgram’s experiment. Then, he gets to the Stanford prison experiment. What these experiments all teach us is how sensible to environments we are. We should realize that a lot of what we do is merely the result of the influence of our surroundings. Thus, the power of shaping environments turns out to be the most powerful of all! And it reinforces my belief that popular scientists have a crucial role to play in shaping the world’s interest for something more universal and more noble than newspapers’ usual topics. An important aspect revealed by the Stanford prison experiment is how actions can build up to affect judgements. As mentioned earlier, Zimbardo and his students all have reported to have become the characters they intended to play. Given enough time, their judgements of the situation were no longer those they would have had they never been part of the experiment. It was deeply affected by their actions. Are you suggesting that actions affect judgements? That’s what Jairon Cuesta suggested! That’s quite counter-intuitive. We tend to think that it goes the other way around. Namely, our intuition says that judgements affect actions, but not the other way around! Yet, the effect of actions on judgements has been confirmed experimentally! Indeed, in a 1980 experiment, American psychologists Gary Wells and Richard Petty asked subjects to perform the test of new headphones, which were playing a BBC extract of a journalist arguing for a university fees increase from 587$ to 750$. Indeed. While listening, a third of the subjects were given no order, another third were told to acquiesce, and the last third were asked to shake their heads as if they were saying no. Then, the subjects, who still thought their role was to judge the quality of the headphone, filled a form. Most questions were about the quality of the headphone, and there was a last question about how much the university fees should be. Let me guess again… The second third gave greater results to this last question than the third one! Exactly! And not by just a little! In average, the first third reported 582$, the second third answered 646$ and the last third said 467$! Isn’t it astonishingly troubling? I know! A mere head motion has induced huge differences in subjects’ judgements! Crucially, actions deeply affect judgements. Just as Jairon Cuesta suggested it! Jairon Cuesta also related judgement to perception! In short, the idea is that once our intuition is confirmed, we don’t go any further in the analysis. And any other information is simply skipped by our intuition. And, like in optical illusions, pieces of information seem to even be made up by our unconscious to confirm this intuition. These all explain why it’s so hard for others to convince us that our convictions are wrong! Even when they are… And even in science. What about the scientific method? Can’t we trust that? I’ll simply refer you to my articles on model-dependent realism and the essential role of beauty in science. Weirdly, our perceptions based on false judgements are still real, as we undergo placebo and nocebo effects. We do perceive better and worse side effects! The last experiment I’ll mention is by far more troubling than all the previous ones combined. In fact, it is so weird that some philosophers have asked scientists not to publicize it too much. But I believe, dear reader, that you can take it! In 1963, American pioneer Benjamin Libet tracked subjects’ brain activities while they were asked to click on a button whenever they felt like doing so. Crucially, subjects were also asked to write down the time when they made the decision. Weirdly though, the experiment revealed that the brain activity kept starting half a second before the decision was actually made! In the more high-tech experiment below, the gap between brain activity and conscious decision is even measured to be of 2 seconds! Libet and others have then interpreted this result as an evidence that conscious decisions are actually made up… by the subconscious! Indeed, by tracking brain activity the experimenter could tell 2 seconds before the subject when the subject was about to click… which the subject was not yet conscious of! In particular, this led Libet to question the existence of free will. Hummm… That is troubling! But can’t the brain activity simply represent some warming up to the decision rather than an unconscious decision? This is precisely what critics argued! In addition, in Libet’s time, the accuracy of measurements was highly questionable and questioned, which led many to simply reject the results of the experiments. But the recent development of IRMs led to a variant with deep and potentially highly controversial conclusions. In 2008, neuroscientists Soon, Brass, Heinze and Haynes published the hugely disturbing results of their experiment. Subjects were simply asked to click on one of two buttons, whichever they wanted and whenever they wanted, while their brains were monitored by an IRM. What were the disturbing results? Haynes and his collaborators showed that they could predict subjects’ choices between 6 to 10 seconds before the subjects were conscious of their decisions! In other words, the experimenters’ consciouses knew long before the subjects’ consciouses what subjects were about to do! Now, if that doesn’t profoundly shock you, you’ve definitely have been reading carefully! In fact, their predictions only turned out to be correct 60% of the time. This might seem small, but it’s already significantly greater than the 50% score of random predictions. But more importantly, keep in mind that today’s technics of IRM are still primitive, and we can only retrieve a tiny fraction of the huge complexity of brain activity. What’s amazing is that, even though we only measure this tiny fraction, we still manage significantly good predictions. And we’d expect to have much better predictions if we really knew where to look for in brain activity. In the video, Haynes makes a clever remark. For him, a lot of misunderstandings of neuroscience comes from Descartes’ dualism of the mind and the body. Since then, common languages have consistently separated the brain from the I. Yet, modern neuroscience rather indicates that consciousness is an inherent property of the brain activity, and that these are hardly separable. So, following these ideas, I guess it’s more accurate to say that we still make our decisions, even before we are conscious of them! So, do you still believe in free will? I believe our troubles with consciousness and free will are due to the weakness of the definitions of these words! What is consciousness? What is free will? What is the mind? What is the soul? One “scientific” approach would be to aim at very precise definitions of these terms… and we’d find out that all these don’t make sense in the fundamental setting of quantum mechanics. But the same remark would hold for words like life, banana or city too… In short, for all of our every day words! Indeed, to have an accurate definition of life or free will, we’d need a description of trillions of trillions of particles, which is both impossible in practice and completely pointless. Therefore, following model-dependent realism, it’s much more relevant to still use badly defined terms like free will, but we need to keep in mind that inaccuracy appears as soon as we use these terms! In this setting, I have no problem with talking about free will, as I still find it hugely relevant and useful, even though I also consider it inaccurate. CGPGrey also made an awesome video on similar problems which arise as we count continents. Through the new coke experiment, we’ve seen how hard it is for us to understand why we like what we like. Asch’s conformity experiment even shows that, despite what many of us would argue, our relatives and friends actually shape how we perceive the world. Then, Milgram’s obedience experiment show how a social environment can make us do unimaginably horrible acts despite our ethical values, which is even more confirmed by Zimbardo’s prison experiment. Then, Wells and Petty’s experiment gave strong evidence for how actions affect judgements, while optical illusions, placebo and nocebo effects show how judgements can affect perceptions. These experiments all show how little in control we are of our decisions. But the icing of the cake of studies of human behaviors is easily Libet’s experiment and the variant by Soon, Brass, Heinze and Haynes, which indicate that most of our decisions are made unconsciously, long before our conscious learns about them! And that should be hugely humbling. Aren’t you saddened by how insignificant this makes you? Overall, these experiments all rather excite me, both as a mathematician and as a conscious being. Yes! More generally, the vastness of what’s yet too be discovered about emerging structures like (apparent) free will is a puzzle that wonders and makes me ponder. It’s as if Nature was given me hugely complex mathematical structures to study, and was challenging me to explain it! And, like many others, I dream about stumbling on an insightful mathematical description of these structures! I see… But as a conscious being, don’t these experiments make you feel… meaningless? On the contrary! First, our subconsciouses take care of so many things that my conscious couldn’t even start dealing with. They’re like super-secretaries inside our own brain! They handle perceptions, judgements and even reflexes! In fact, I strongly believe that my subconscious is the one who solved most mathematical problems I’ve been taking credit for. He’s the super-hero I don’t put forward often enough… So, no, the fact that my conscious is its byproduct doesn’t upset me at all. I owe my subconscious so much! Probably even more than I think, even after having written this article! Still… This makes your conscious a passenger trapped in your body, right? Careful, you’re using Descartes’ dualism! Neuroscience actually teaches us that we mostly are our subconscious. Which leads me to the main reason why all these experiments make me feel very meaningful! Think about it. I have the immense privilege of enjoying conscious and subconscious, which are two astonishing products of billions of years of evolution, and hugely complex structures! Now, this… This is making me feel special. It gives me immense respect and gratitude for Nature. And this feeling, which once again is just a complex structure of neuronal signals, is even stronger now that I understand better how complex it is! This might sound petty, but it really is how I feel! And this is how I wish you would feel, because embracing positively all these developments is hugely important for further advancing their frontiers. And such optimistic perspectives are matter of public health, as explained in this fantastic BBC documentary by Michael Mosley! In fact, these experiments all stress the importance of explaining what makes science awesome. This is probably some of the most important knowledge to disseminate. It motivates to more critically reflect on your decision making processes. The Stanford prison experiment I first encountered in high school. Having attended school in Germany it is self-explanatory why it was featured prominently. Key is, that I strongly believe that if people are made aware of the seductions and pit-falls of blindly following authority, they will be far more critical in accepting authority in the first place.